The Department of Agriculture and Food, Western Australia is undertaking surveillance in commercial crops and backyard gardens in the Perth area, following the suspect detection of tomato potato psyllid (Bactericera cockerelli). This psyllid is an insect that attacks a range of plants in the Solanaceae family which includes potato, tomato, eggplant, capsicum, chilli and tamarillo. The pest has been found in a capsicum crop in a commercial property north of Perth, in backyard tomatoes and eggplants in Belmont and backyard tomatoes at two properties in Mount Hawthorn. DNA barcoding is underway to confirm the identity of the pest. These results are expected this week. If confirmed, this would be the first time the psyllid has been detected in Australia. The tomato potato psyllid is a significant production pest in other countries where it is present, which are the USA, Central America, New Zealand and Norfolk Island, which is an external Australian Territory. The tomato potato psyllid is also capable of transmitting a disease known as zebra chip which poses a threat to important horticultural crops. Testing is underway to determine whether the bacterium that causes zebra chip is present. The bacterium has not been found in any samples taken to date. The Department of Agriculture and Food, Western Australia has quarantined the affected properties and put biosecurity restrictions in place on the movement of people, vegetable and plant material off these properties. Officers are also carrying out surveys on properties within the wider metropolitan area to determine how widespread the psyllid is. Tomato potato psyllid is a tiny sap‐sucking insect. Adults resemble small winged cicadas and are about 3mm long. The body is brownish and has white or yellowish markings on the thorax and a broad white band on the abdomen. Wings are transparent and held vertically over the body. Honeydew and psyllid sugar make the plants sticky and they often appear dirty. The death of the stem is similar to other potato and tomato disorders. The tomato potato psyllid can carry the bacterium “Candidatus Liberibacter solanacearum”, causing the ‘zebra chip’ disease in potato. Commercial producers and backyard growers are urged to check their crops for signs of the psyllid and be vigilant for early warning signs. If you think the tomato potato psyllid may be present in your crop or backyard plants, you need to report this to your state or territory department of agriculture or primary industries. You can do this by phoning the Exotic Plant Pest Hotline on 1800 084 881. In Western Australia you can report your detection to the Exotic Plant Pest Hotline on 1800 084 881 or you can use the WA Department of Agriculture and Food’s MyPestGuide reporting app. Details about how to access and use the app are available on the Department of Agriculture and Food’s website at agric.wa.gov.au. Growers are asked not to spray or disturb suspected plants at this time, until their crops have been surveyed and the most appropriate chemicals for this pest have been identified. Tomato potato psyllid can spread through the movement of tomato, capsicum, eggplant, tamarillo and other Solanaceae plant material. It can also occur on other hosts including Convolvulaceae, which includes sweet potato. It can also disperse through natural pathways such as flight and on the wind. 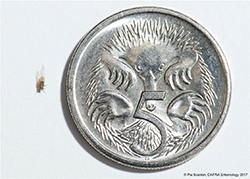 More information about the pest including photos to help you identify it, are available on the Department of Agriculture and Food’s website agric.wa.gov.au. As a general reminder, all growers need to practise sound farm biosecurity to prevent the entry, establishment and spread of pests and diseases. Find out more at farmbiosecurity.com.au. Developed by the NGIA National Nursery Industry Biosecurity Program Team 2017. This project has been funded by Horticulture Innovation Australia Limited using the Nursery Products levy and funds from the Australian Government.